And COMING SOON – outside! Ah well. OF course, this is normal. All of it. 3 days into the headcold, and eager to be done with it! My energy is down. Then, bracing for the outdoor cold coming tomorrow – possible snow! But me, I’m strange, I kind of like it. 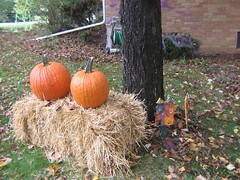 I remember when Colleen was Ryan’s age and she said “snow on the pumpkins!” I’d like to hear my Ryan say that. But he’s coming along – he regularly says “pumpkin.” And yesterday he looked up at the full moon without my prompting and said “moon” (but pronounced it “moan” ha ha!). And it was the early morning chilly air, waiting for the bus for his preschool, and a bird flew across the sky in the dawn and he said “bird” and pointed.